In addition to conventional surgical approaches, total hip arthroplasty (THA) may be done via minimally invasive surgery (MIS). Minimally invasive THA (MIS-THA) is often portrayed in the lay community and press as involving a small skin incision; actually, it is limited soft-tissue and bony dissection. Existing MIS-THA techniques are based on variations of conventional surgical approaches that have been used by surgeons for decades. To date, no single technique has been proved superior to the others. The benefits of a shorter incision (see the image below) must outweigh the added technical difficulty caused by reduced visualization. The choice of operative approach depends on surgeon preference and experience. Minimally invasive total hip arthroplasty. Shown are skin incisions for direct anterior (black), miniposterior/lateral/anterolateral (dark blue), conventional posterior (dark blue plus red extensions), direct superior (green), and SuperPATH (purple) approaches to hip. Conventional posterior incision is usually 10-25 cm long. Single incisions for minimally invasive approaches are usually less than 10 cm long. In two-incision approach, both incisions are usually less than 5 cm long. In addition to conventional surgical approaches, total hip arthroplasty (THA) may be done via minimally invasive surgery (MIS). Minimally invasive THA (MIS-THA) is often portrayed in the lay community and press as involving a small skin incision; actually, it is limited soft-tissue and bony dissection. Existing MIS-THA techniques are based on variations of traditional direct anterior, anterolateral, direct lateral, and posterior surgical approaches that have been used by surgeons for decades. To date, no single technique has been proved definitively superior to the others. For surgeons, the benefits of a shorter incision must outweigh the added technical difficulty from reduced visualization. A thorough knowledge of the relevant anatomy is important for any elective procedure but takes on added significance for MIS-THA. The hip consists of a ball (femoral head) that fits into a socket (acetabulum); the joint capsule and the surrounding ligaments and muscles provide stability to the joint. Ideally, for MIS-THA to be considered, there should be little or no anatomic deformity of the femoral head and acetabulum. Surgeons may try to progressively shorten their incisions while on the upward portion of the learning curve. Degenerative arthritis of the hip can often be managed medically by means of reasonable exercise, therapy, analgesics, assistive devices to unload the diseased hip, and alternative pain management techniques that work for a particular patient. If medical therapy fails, then surgical therapy can be considered. Specific indications for MIS-THA vary by author and by type of surgical approach. Most authorities cite the presence of a straightforward anatomy and the absence of obesity (ie, body mass index [BMI] lower than 30 kg/m2) as desirable factors in choosing patients for MIS, especially early in the surgeon’s learning curve. Although MIS-THA is increasingly being used as an alternative to conventional THA, there is still some debate as to whether MIS-THA is an acceptable replacement for or even an improvement on conventional THA. At present, although there is support for MIS-THA in the literature, no definitive answer to this question is available. Before undertaking MIS-THA, surgeons need to gain specialized hands-on training by operating on cadavers and by visiting experienced surgeons. A double-blinded, randomized, controlled trial determined that the risks associated with MIS-THA were doubled in a surgeon’s first 60 cases but that this increased risk was not present in the surgeon’s next 60 cases. These data give some idea of the learning curve associated with MIS-THA and suggest that surgeons should not undertake this procedure without appropriate training and mentorship. Computer or robotic guidance is currently advocated by some and may allow virtual visualization of the minimally exposed surgical anatomy. The advantage of such guidance is that the proper medialization for correct coverage of the cup can be both qualitatively and quantitatively achieved. The growth of interest in MIS-THA is related to market- and patient-driven demand for the procedure. In one study, 53% of hip surgeons admitted feeling pressured to use a specific surgical technique or implant as a result of a patient request, in some cases in a way that they believed could be harmful to their patients. Surgeons should consider whether they are prepared to subject themselves to the increased stress and learning curve associated with MIS-THA, especially if the desire for MIS-THA does not exist among their patients. The learning curve connected with MIS-THA is steep, and mastering the skill is frequently an ongoing process. Comorbid conditions (eg, obesity, diabetes mellitus, alcoholism, and hypertension) influence rehabilitation more than incision length. Any functional advantages of MIS-THA disappear by 6 weeks to 6 months after surgery. It is yet to be determined whether good pain scores and functional recovery are due to MIS or to newer anesthesia and pain-management techniques. Studies suggest that young patient age and high preoperative hemoglobin levels are the only factors associated with shorter hospital stays; incision size is not. Poehling-Monaghan et al, in a study of 222 patients receiving either direct anterior or miniposterior THAs, found no differences in mean length of stay, operative or in-hospital complications, maximum feet walked in hospital, or percent discharged to home. Direct anterior patients had longer mean operating times than miniposterior patients (114 vs 60 minutes). In addition, they had greater need for gait aids at 2 weeks (92% vs 68%) but higher Harris Hip Scores at 8 weeks (95 vs 89). Direct anterior patients had lower rates of return to work and driving but did not differ in regard to use of gait aids, narcotics, activities of daily living, or walking 0.5 miles. Fewer wound problems occurred in the direct anterior group. Maratt et al compared dislocation rates between direct anterior and posterior THA in 2147 patients. There was no reported difference in dislocation rates (0.84% for direct anterior vs 0.79% for posterior). They also agreed with the previous literature in noting a slightly shorter length of stay with the direct anterior approach but a higher risk of fracture, increased blood loss, and increased hematoma risk. Tripuraneni et al, in a matched cohort of 132 hip procedures, compared 66 direct anterior THAs with 66 posterior THAs. Average acetabular abduction angle was 41.9° (range, 32-60°) in the posterior group and 43.8° (range, 30-62°) in the direct anterior group. The percentage of outliers (outside the Lewinnek safe zone, 30-50°) was 9.1% in the posterior group and 13.6% in the direct anterior group. There were two anterior dislocations in the direct anterior group and one anterior dislocation in the posterior group. Overall, it was concluded that there was no observable difference in hip stability or acetabular abduction between the direct anterior and posterior approaches. Berend et al investigated the incidence of early periprosthetic fractures associated with primary THA in the direct anterior approach. After identifying 2689 primary THAs, they reported 26 (0.9%) early periprosthetic femoral fractures, with 23 requiring revision. Analyzing risk factors, including age, gender, body mass index, and stem length, they noted that only increased age was associated with an increased risk of femoral fracture. Finally, logistic regression analysis revealed a significant age-fracture association for female gender only, which remained when controlled for BMI, stem length, or both. Xu et al, in a case-control study of 149 patients, compared the anterolateral approach with the posterolateral approach in terms of hip abductor strength and function. At 3 months after surgery, the anterolateral group had significantly better hip abduction angles. At 6 months after surgery, the anterolateral group had significantly better hip abductor strength. No differences were observed in Harris Hip Scores at any time point up to 1 year after surgery. The observed differences were attributed to the fewer muscles interrupted in the anterolateral approach. Tsai et al reported on outcomes in 1077 primary THAs performed in 1003 patients. Median wound length was 6 cm (range, 4.8-9.2), median operation time was 68 minutes (range, 45-112). Mean perioperative blood loss was 422 mL (range, 56-990). The median cup inclination angle was 44º (range, 33-54º), median acetabular version angle was 17° (range, 12-24º), and median hospital stay was 4 days (range, 3-8). A total of 22 (2.0%) complications were noted, including five cases of stem subsidence, four of cup loosening, five greater trochanter fractures, four infections, two intraoperative proximal femur fractures, and two iliopsoas impingements. In all, 13 (1.2%) received additional surgery. No neurovascular injury or dislocation was noted. The Harris Hip Score improved from 53 (range, 33-67) preoperatively to 94 postoperatively (range, 87-100). Nakai et al compared 103 anterolateral-approach THAs with 98 posterolateral-approach THAs. In the anterolateral group, intraoperative fracture was observed in six hips, three in the greater trochanter and three in the calcar femorale. One hip was subjected to irrigation because postoperative infection was suspected. In the posterolateral group, intraoperative fracture was demonstrated in four hips in the calcar femorale. No postoperative dislocation and no pulmonary embolism or nerve paralysis were observed in either group. 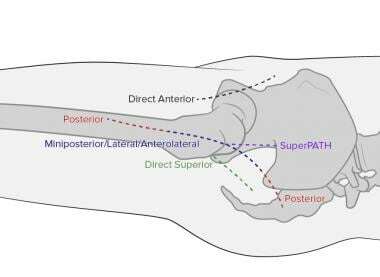 The authors noted that by their measurements, the anterolateral approach was not superior to the posterolateral approach. De Beer et al, in a comparison of matched-pair cohorts comprising 30 patients who underwent primary MIS-THA and 30 who underwent conventional THA via the direct lateral approach, reported no significant differences in operating time, opioid consumption, postoperative blood loss, complications, length of hospital stay, and Harris and Oxford hip scores 6 weeks after the procedure.  .
De Anta-Diaz et al compared muscle damage and functional outcomes between 50 lateral-approach patients and 49 direct anterior patients in a randomized controlled study. Postoperatively, there were significantly higher mean levels of interleukin (IL)-6, IL-8, and tumor necrosis factor alpha (TNF-α) in the lateral group up to postoperative day 4. By magnetic resonance imaging (MRI) at postoperative month 6, the lateral group showed greater fatty atrophy in the gluteus muscles but similar degrees in the other muscles. The mean thickness of the tensor fasciae latae (TFL) was significantly higher in the lateral group. Functional outcome was similar between groups at 3 and 12 months postoperatively. Eto et al, in a retrospective review of revision THAs, found that the direct anterior approach was associated with early revision surgery when compared with the posterior and anterolateral (nondirect anterior) approaches. Aseptic loosening occurred in 30% of the direct anterior cases, whereas the rate was 8% for the nondirect anterior approaches. Mardones et al, in a cadaveric study, compared the extent and location of damage to the abductor and external rotator muscles and tendons after two-incision and miniposterior THA. Damage to the muscle of the gluteus medius and gluteus minimus was substantially less with the miniposterior technique than with the two-incision technique. Every miniposterior hip replacement caused the external rotators to detach during the exposure and caused additional measurable damage to the abductor muscles and tendon. None of the two-incision hip replacements were done without cutting, reaming, or damaging the gluteus medius or gluteus minimus muscle or external rotators. A cadaveric study by Meneghini et al compared direct anterior and posterior approaches in 12 hips. The mean amount of damage to the gluteus medius was 2.62% of its muscular area (range, 0-7.94%) in the direct anterior group and 2.85% (range, 0-8.9%) in the posterior group. Muscle damage to the TFL occurred in all six specimens in the direct anterior group and was a mean of 31.32% (range, 18.31–58.48%) of its muscular area. The direct head of the rectus femoris was damaged a mean of 12.24% (range, 0-24%) of its muscular area in the direct anterior group, with preservation of its origin on the anterior superior iliac spine (ASIS) in each specimen. Neither site of damage was noted in the posterior group. Pagnano et al, in a comparison of two-incision THA with posterior MIS-THA in 26 patients who underwent staged bilateral MIS-THA (with two-incision MIS-THA on one hip and posterior MIS-THA on the other), found that the majority of patients preferred the latter. The added surgical technical difficulty of the two-incision MIS-THA was not rewarded with an earlier return to functional activities. There were no differences in the times to discontinue ambulatory aids, to return to driving, to climb stairs, to return to work, or to walk half a mile. Many patients were annoyed by the mere presence of the anterior incision during simple daily activities (eg, bathing or changing clothes) because the incision was clearly visible. When 100 of the patients in this study were selected randomly for gait analysis, no differences related to incision length were demonstrated in average stride length, cadence, or walking speed. The main determinant for discharge home was adequate family support; age and preoperative hematocrit correlated with length of hospital stay. Woolson et al, in a retrospective comparison of 50 posterior MIS-THAs and 85 conventional THAs, found no differences in transfusion rate, estimated blood loss, operating time, or length of hospital stay. They did note an increased number of malpositioned components in the MIS-THA cohort. Acetabular inclination was less than 30° or more than 50° in 30% of the MIS-THAs, compared with 15% of the conventional THAs. The femoral stem was in varus in 12% of the MIS-THAs, compared with 4% of the conventional THAs. When hemodialysis patients were excluded, there was a significant increase in wound complications in the MIS-THA cohort as compared with the conventional THA cohort. Of the MIS-THAs, 33% were graded as having poor fit and fill, compared with 14% of conventional THAs. The MIS-THA cohort reported a significantly higher incidence of wound edges curling into the scar. Winther at al conducted a prospective cohort study comparing the direct anterior, posterior, and lateral approaches. At 6 weeks after surgery, the posterior approach allowed greater hip abduction strength than the direct anterior approach and allowed greater muscle strength than the lateral approach. At 3 months post surgery, however, no significant differences in muscle strength were found between the three groups. Khan et al initially described the piriformis-sparing approach in a study comparing 100 patients undergoing this procedure with 100 patients undergoing a standard posterior approach. With a minimum follow-up of 2 years, they reported lower mean blood loss in the piriformis group, shorter inpatient stay, and greater improvement in WOMAC scores for up to 1 year. Khan et al later compared the piriformis-sparing and standard posterior approaches in a randomized controlled study of 100 patients. In the piriformis-sparing group, there was a trend towards a better 6-minute walk test at 2 weeks and greater patient satisfaction at 6 weeks, and the acetabular components were less anteverted and had a lower mean inclination angle. In both groups, mean component positions were within Lewinnek's safe zone. Surgeons perceived the piriformis-sparing approach as significantly more difficult, particularly in obese patients, leading them to conclude that as compared with the standard posterior approach, it is more difficult while providing only short-term benefits. A cadaveric study comparing the direct anterior and direct superior approaches found no statistically significant difference in the rate of gluteus medius and quadratus femoris muscle injury in terms of percentage of surface area. The direct superior approach was associated with less damage to the gluteus minimus, the TFL, and the rectus femoris. Finally, there was no statistically significant difference in the percentage of surface area of damage to the gluteus medius tendon between these approaches; however, it was noted that the direct superior approach had a statistically reduced transected length of the gluteus minimus tendon as compared with the direct anterior approach. Roger et al retrospectively analyzed outcomes of 135 patients undergoing the direct superior approach. There were no dislocations, no sciatic nerve palsies, no wound complications, and low transfusion rates (8%). The postoperative Harris Hip Score averaged 96.5 (range, 87-100). Overall acetabular cup abduction angle averaged 41 (range, 21-49), and anteversion averaged 21 (range, 15-27). Four percent and 2% of femoral components were inserted into more than 2º varus and 2º valgus alignment, respectively. Of these patients, 25% sustained an LFCN injury, and one patient had neurapraxia of the femoral nerve. Surgical experience proved highly significant: The rate of complications associated with the two-incision approach decreased substantially after the initial learning curve had been completed, resulting in a reliably safe and predictable operation. Nivbrant et al, in a clinical and cadaveric study documenting anatomic variations of LFCN injury during minimally invasive two-incision MIS-THA, reported a 38% incidence of paresthesia in the nerve’s distribution postoperatively, with almost 50% resolution at 6-month follow-up. Upon cadaveric dissection (97 specimens), the investigators identified a significant variation in the lateral branch of the LFCN in 31% of cases, which correlated with proximal and lateral thigh sensory loss. Archibeck et al, reviewing results of the first 10 cases performed by surgeons who had completed the two-incision MIS-THA training course, noted a challenging learning curve. Investigators observed no complications in 47% of cases, one complication in 37%, and more than one complication in 22%. Femur fractures occurred in 6.5% of cases. Nerve injury occurred in 3.2%, consisting mostly of lateral femoral cutaneous nerve injury and an isolated case of sciatic nerve injury. Early revisions were seen in 0.9% of patients (seven for infection and eight for dislocation). Patients with BMIs greater than 30 kg/m2 had a higher complication rate (16.3%) than those with BMIs less than 30 kg/m2 (8.3%). The most striking finding of this study was that the number of complications did not significantly decrease from the first to the tenth case in a single surgeon’s experience, which suggests the learning curve may extend beyond the first 10 cases. Accordingly, this procedure may be best performed by specially trained surgeons who perform a high volume of these cases. In a randomized controlled trial comparing the miniposterior and two-incision approaches, Sershon et al found no significant differences in Harris Hip Scores or 12-item Short Form Survey physical and mental composite scores. However, a longer operating time, increased operative complexity, and need for fluoroscopy in the two-incision approach were found to be significant disadvantages. Penenberg et al, in a study of 250 consecutive hip implants with the SuperPATH approach, found no increased risk of component malposition, dislocation, or other adverse effects at the time of short-term evaluation or follow-up for 24 months. The authors cite improvements made with regard to instrumentation, which allow this technique to be user-friendly and likely to be associated with a shorter learning curve than the two-incision approach. Torre et al, in a case series, had an independent third party analyze postoperative radiographs in 66 of the first 100 patients who underwent the SuperPATH approach for component positioning and seating, femoral offset, and leg length. Analysis deemed all components in the case series to be well seated and positioned. Leg lengths were measured to within 5 mm of the contralateral side, and mean acetabular abduction angle was 40.13°. It was concluded that implant position was optimal within the learning curve of the first 100 cases for described THA safe zones. Rasuli et al, comparing the first consecutive 49 PATH cases with the first 50 SuperPATH cases, reported the mean operating times for the two procedures (114.5 ± 17.5 minutes and 101.7 ± 18.3 minutes, respectively). They noted that PATH operating time reached a plateau by case 40, whereas SuperPATH operating time continued to decrease by case 50. In addition, mean length of stay was shorter for SuperPATH (2.2 vs 3.0 days). Finally, Rasuli et al noted that acetabular cups were significantly more anteverted and less abducted in the SuperPATH cohort (anteversion, 23.5° ± 8.2°; abduction, 39.0° ± 8.4°) than in the PATH cohort (anteversion, 13.1° ± 7.1°; abduction, 42.9° ± 7.6°). Despite the learning curve, these results indicate that PATH and SuperPATH approaches can be adopted with minimal complications and outcomes consistent with innovator outcomes. Gofton et al, in a retrospective study of healthcare databases at three institutions, found that patients implanted using the SuperPATH technique experienced reduced 30-day all-cause readmission rates (2.3% vs 4.2%) and were more routinely discharged home (91.5% vs 27.3%) than was previously reported for patients in the United States. They concluded that use of this tissue-sparing technique has the potential to significantly reduce postdischarge costs. Havelin LI, Engesaeter LB, Espehaug B, Furnes O, Lie SA, Vollset SE. The Norwegian Arthroplasty Register: 11 years and 73,000 arthroplasties. Acta Orthop Scand. 2000 Aug. 71(4):337-53. [Medline]. Howell JR, Masri BA, Duncan CP. Minimally invasive versus standard incision anterolateral hip replacement: a comparative study. Orthop Clin North Am. 2004 Apr. 35(2):153-62. [Medline]. Berry DJ, Berger RA, Callaghan JJ, Dorr LD, Duwelius PJ, Hartzband MA. Minimally invasive total hip arthroplasty. Development, early results, and a critical analysis. Presented at the Annual Meeting of the American Orthopaedic Association, Charleston, South Carolina, USA, June 14, 2003. J Bone Joint Surg Am. 2003 Nov. 85-A(11):2235-46. [Medline]. Sculco TP, Jordan LC, Walter WL. Minimally invasive total hip arthroplasty: the Hospital for Special Surgery experience. Orthop Clin North Am. 2004 Apr. 35(2):137-42. [Medline]. Goosen JH, Kollen BJ, Castelein RM, Kuipers BM, Verheyen CC. Minimally invasive versus classic procedures in total hip arthroplasty: a double-blind randomized controlled trial. Clin Orthop Relat Res. 2011 Jan. 469(1):200-8. [Medline]. [Full Text]. Goldstein WM, Branson JJ. Posterior-lateral approach to minimal incision total hip arthroplasty. Orthop Clin North Am. 2004 Apr. 35(2):131-6. [Medline]. Berger RA. Total hip arthroplasty using the minimally invasive two-incision approach. Clin Orthop Relat Res. 2003 Dec. (417):232-41. [Medline]. Berger RA. The technique of minimally invasive total hip arthroplasty using the two-incision approach. Instr Course Lect. 2004. 53:149-55. [Medline]. Wright JM, Crockett HC, Delgado S, Lyman S, Madsen M, Sculco TP. Mini-incision for total hip arthroplasty: a prospective, controlled investigation with 5-year follow-up evaluation. J Arthroplasty. 2004 Aug. 19(5):538-45. [Medline]. Mow CS, Woolson ST, Ngarmukos SG, Park EH, Lorenz HP. Comparison of scars from total hip replacements done with a standard or a mini-incision. Clin Orthop Relat Res. 2005 Dec. 441:80-5. [Medline]. Woolson ST, Mow CS, Syquia JF, Lannin JV, Schurman DJ. Comparison of primary total hip replacements performed with a standard incision or a mini-incision. J Bone Joint Surg Am. 2004 Jul. 86-A(7):1353-8. [Medline]. Kiyama T, Naito M, Shitama H, Shinoda T, Maeyama A. Comparison of skin blood flow between mini- and standard-incision approaches during total hip arthroplasty. J Arthroplasty. 2008 Oct. 23(7):1045-9. [Medline]. Reininga IH, Zijlstra W, Wagenmakers R, Boerboom AL, Huijbers BP, Groothoff JW, et al. Minimally invasive and computer-navigated total hip arthroplasty: a qualitative and systematic review of the literature. BMC Musculoskelet Disord. 2010 May 17. 11:92. [Medline]. [Full Text]. Smith TO, Blake V, Hing CB. Minimally invasive versus conventional exposure for total hip arthroplasty: a systematic review and meta-analysis of clinical and radiological outcomes. Int Orthop. 2011 Feb. 35(2):173-84. [Medline]. [Full Text]. van Oldenrijk J, Hoogland PV, Tuijthof GJ, Corveleijn R, Noordenbos TW, Schafroth MU. Soft tissue damage after minimally invasive THA. Acta Orthop. 2010 Dec. 81(6):696-702. [Medline]. Hartzband MA. Posterolateral minimal incision for total hip replacement: technique and early results. Orthop Clin North Am. 2004 Apr. 35(2):119-29. [Medline]. Cheng T, Feng JG, Liu T, Zhang XL. Minimally invasive total hip arthroplasty: a systematic review. Int Orthop. 2009 Dec. 33(6):1473-81. [Medline]. [Full Text]. de Beer J, Petruccelli D, Zalzal P, Winemaker MJ. Single-incision, minimally invasive total hip arthroplasty: length doesn't matter. J Arthroplasty. 2004 Dec. 19(8):945-50. [Medline]. Ogonda L, Wilson R, Archbold P, Lawlor M, Humphreys P, O'Brien S, et al. A minimal-incision technique in total hip arthroplasty does not improve early postoperative outcomes. A prospective, randomized, controlled trial. J Bone Joint Surg Am. 2005 Apr. 87 (4):701-10. [Medline]. Kennon R, Keggi J, Zatorski LE, Keggi KJ. Anterior approach for total hip arthroplasty: beyond the minimally invasive technique. J Bone Joint Surg Am. 2004. 86-A Suppl 2:91-7. [Medline]. Siguier T, Siguier M, Brumpt B. Mini-incision anterior approach does not increase dislocation rate: a study of 1037 total hip replacements. Clin Orthop Relat Res. 2004 Sep. 164-73. [Medline]. Matta JM, Shahrdar C, Ferguson T. Single-incision anterior approach for total hip arthroplasty on an orthopaedic table. Clin Orthop Relat Res. 2005 Dec. 441:115-24. [Medline]. Rachbauer F. [Minimally invasive total hip arthroplasty via direct anterior approach]. Orthopade. 2005 Nov. 34(11):1103-4, 1106-8, 1110. [Medline]. Poehling-Monaghan KL, Kamath AF, Taunton MJ, Pagnano MW. Direct anterior versus miniposterior THA with the same advanced perioperative protocols: surprising early clinical results. Clin Orthop Relat Res. 2015 Feb. 473 (2):623-31. [Medline]. Maratt JD, Gagnier JJ, Butler PD, Hallstrom BR, Urquhart AG, Roberts KC. No Difference in Dislocation Seen in Anterior Vs Posterior Approach Total Hip Arthroplasty. J Arthroplasty. 2016 Sep. 31 (9 Suppl):127-30. [Medline]. Tripuraneni KR, Munson NR, Archibeck MJ, Carothers JT. Acetabular Abduction and Dislocations in Direct Anterior vs Posterior Total Hip Arthroplasty: A Retrospective, Matched Cohort Study. J Arthroplasty. 2016 Oct. 31 (10):2299-302. [Medline]. Berend KR, Mirza AJ, Morris MJ, Lombardi AV Jr. Risk of Periprosthetic Fractures With Direct Anterior Primary Total Hip Arthroplasty. J Arthroplasty. 2016 Oct. 31 (10):2295-8. [Medline]. Pflüger G, Junk-Jantsch S, Schöll V. Minimally invasive total hip replacement via the anterolateral approach in the supine position. Int Orthop. 2007 Aug. 31 Suppl 1:S7-11. [Medline]. [Full Text]. Xu Y, Duanmu QL, Yang M, Lin H, He J, He J, et al. [Case-control study on effect of anterolateral and posterolateral approaches on early postoperative hip abductor strength in total hip arthroplasty]. Zhongguo Gu Shang. 2016 Feb. 29 (2):114-8. [Medline]. Tsai SW, Chen CF, Wu PK, Chen TH, Liu CL, Chen WM. Modified anterolateral approach in minimally invasive total hip arthroplasty. Hip Int. 2015 May-Jun. 25 (3):245-50. [Medline]. Nakai T, Liu N, Fudo K, Mohri T, Kakiuchi M. Early complications of primary total hip arthroplasty in the supine position with a modified Watson-Jones anterolateral approach. J Orthop. 2014 Dec. 11 (4):166-9. [Medline]. [Full Text]. Ilizaliturri VM Jr, Chaidez PA, Valero FS, Aguilera JM. Small incision total hip replacement by the lateral approach using standard instruments. Orthopedics. 2004 Apr. 27(4):377-81. [Medline]. Higuchi F, Gotoh M, Yamaguchi N, Suzuki R, Kunou Y, Ooishi K, et al. Minimally invasive uncemented total hip arthroplasty through an anterolateral approach with a shorter skin incision. J Orthop Sci. 2003. 8(6):812-7. [Medline]. De Anta-Díaz B, Serralta-Gomis J, Lizaur-Utrilla A, Benavidez E, López-Prats FA. No differences between direct anterior and lateral approach for primary total hip arthroplasty related to muscle damage or functional outcome. Int Orthop. 2016 Oct. 40 (10):2025-2030. [Medline]. Eto S, Hwang K, Huddleston JI, Amanatullah DF, Maloney WJ, Goodman SB. The Direct Anterior Approach is Associated With Early Revision Total Hip Arthroplasty. J Arthroplasty. 2017 Mar. 32 (3):1001-1005. [Medline]. Mardones R, Pagnano MW, Nemanich JP, Trousdale RT. The Frank Stinchfield Award: muscle damage after total hip arthroplasty done with the two-incision and mini-posterior techniques. Clin Orthop Relat Res. 2005 Dec. 441:63-7. [Medline]. Meneghini RM, Pagnano MW, Trousdale RT, Hozack WJ. Muscle damage during MIS total hip arthroplasty: Smith-Petersen versus posterior approach. Clin Orthop Relat Res. 2006 Dec. 453:293-8. [Medline]. Swanson TV. Early results of 1000 consecutive, posterior, single-incision minimally invasive surgery total hip arthroplasties. J Arthroplasty. 2005 Oct. 20(7 Suppl 3):26-32. [Medline]. Wenz JF, Gurkan I, Jibodh SR. Mini-incision total hip arthroplasty: a comparative assessment of perioperative outcomes. Orthopedics. 2002 Oct. 25(10):1031-43. [Medline]. Pagnano MW, Leone J, Lewallen DG, Hanssen AD. Two-incision THA had modest outcomes and some substantial complications. Clin Orthop Relat Res. 2005 Dec. 441:86-90. [Medline]. Dorr L, Long WT, Inaba Y, Sirianni LE, Boutary M. MIS Total Hip Replacement with a Single Posterior Approach. Seminars in Arthroplasty. December 2005. 16:179-85. Dorr LD, Thomas D, Long WT, Polatin PB, Sirianni LE. Psychologic reasons for patients preferring minimally invasive total hip arthroplasty. Clin Orthop Relat Res. 2007 May. 458:94-100. [Medline]. Goldstein WM, Branson JJ, Berland KA, Gordon AC. Minimal-incision total hip arthroplasty. J Bone Joint Surg Am. 2003. 85-A Suppl 4:33-8. [Medline]. Winther SB, Husby VS, Foss OA, Wik TS, Svenningsen S, Engdal M, et al. Muscular strength after total hip arthroplasty. A prospective comparison of 3 surgical approaches. Acta Orthop. 2016 Feb. 87 (1):22-8. [Medline]. Khan RJ, Fick D, Khoo P, Yao F, Nivbrant B, Wood D. Less invasive total hip arthroplasty: description of a new technique. J Arthroplasty. 2006 Oct. 21 (7):1038-46. [Medline]. Khan RJ, Maor D, Hofmann M, Haebich S. A comparison of a less invasive piriformis-sparing approach versus the standard posterior approach to the hip: A randomised controlled trial. J Bone Joint Surg Br. 2012 Jan. 94 (1):43-50. [Medline]. Amanatullah DF, Masini MA, Roger DJ, Pagnano MW. Greater inadvertent muscle damage in direct anterior approach when compared with the direct superior approach for total hip arthroplasty. Bone Joint J. 2016 Aug. 98-B (8):1036-42. [Medline]. Roger DJ, Hill D. Minimally invasive total hip arthroplasty using a transpiriformis approach: a preliminary report. Clin Orthop Relat Res. 2012 Aug. 470 (8):2227-34. [Medline]. Bal BS, Haltom D, Aleto T, Barrett M. Early complications of primary total hip replacement performed with a two-incision minimally invasive technique. J Bone Joint Surg Am. 2005 Nov. 87(11):2432-8. [Medline]. Bal BS, Haltom D, Aleto T, Barrett M. Early complications of primary total hip replacement performed with a two-incision minimally invasive technique. Surgical technique. J Bone Joint Surg Am. 2006 Sep. 88 Suppl 1 Pt 2:221-33. [Medline]. Irving JF. Direct two-incision total hip replacement without fluoroscopy. Orthop Clin North Am. 2004 Apr. 35(2):173-81. [Medline]. Archibeck MJ, White RE Jr. Learning curve for the two-incision total hip replacement. Clin Orthop Relat Res. 2004 Dec. 232-8. [Medline]. Sershon RA, Tetreault MW, Della Valle CJ. A Prospective Randomized Trial of Mini-Incision Posterior and 2-Incision Total Hip Arthroplasty: Minimum 5-Year Follow-Up. J Arthroplasty. 2017 Aug. 32 (8):2462-2465. [Medline]. Penenberg BL, Bolling WS, Riley M. Percutaneously assisted total hip arthroplasty (PATH): a preliminary report. J Bone Joint Surg Am. 2008 Nov. 90 Suppl 4:209-20. [Medline]. Della Torre PK, Fitch DA, Chow JC. Supercapsular percutaneously-assisted total hip arthroplasty: radiographic outcomes and surgical technique. Ann Transl Med. 2015 Aug. 3 (13):180. [Medline]. [Full Text]. Rasuli KJ, Gofton W. Percutaneously assisted total hip (PATH) and Supercapsular percutaneously assisted total hip (SuperPATH) arthroplasty: learning curves and early outcomes. Ann Transl Med. 2015 Aug. 3 (13):179. [Medline]. Gofton W, Chow J, Olsen KD, Fitch DA. Thirty-day readmission rate and discharge status following total hip arthroplasty using the supercapsular percutaneously-assisted total hip surgical technique. Int Orthop. 2015 May. 39 (5):847-51. [Medline]. Sculco TP, Jordan LC. The mini-incision approach to total hip arthroplasty. Instr Course Lect. 2004. 53:141-7. [Medline]. Bertin KC, Rottinger H. Anterolateral mini-incision hip replacement surgery: a modified Watson-Jones approach. Clin Orthop Relat Res. 2004 Dec. 248-55. [Medline]. Scuderi GR, Tenholder M, Capeci C. Surgical approaches in mini-incision total knee arthroplasty. Clin Orthop Relat Res. 2004 Nov. 61-7. [Medline]. Woolson ST, Pouliot MA, Huddleston JI. Primary total hip arthroplasty using an anterior approach and a fracture table: short-term results from a community hospital. J Arthroplasty. 2009 Oct. 24(7):999-1005. [Medline]. Jolles BM, Bogoch ER. Posterior versus lateral surgical approach for total hip arthroplasty in adults with osteoarthritis. Cochrane Database Syst Rev. 2006 Jul 19. CD003828. [Medline]. Bergstrom B, Lindberg L, Persson BM, Onnerfalt R. Complications after total hip arthroplasty according to Charnley in a Swedish series of cases. Clin Orthop Relat Res. 1973 Sep. 91-5. [Medline]. Amstutz HC, Maki S. Complications of trochanteric osteotomy in total hip replacement. J Bone Joint Surg Am. 1978 Mar. 60(2):214-6. [Medline]. Abitbol JJ, Gendron D, Laurin CA, Beaulieu MA. Gluteal nerve damage following total hip arthroplasty. A prospective analysis. J Arthroplasty. 1990 Dec. 5(4):319-22. [Medline]. Kennon RE, Keggi JM, Wetmore RS, Zatorski LE, Huo MH, Keggi KJ. Total hip arthroplasty through a minimally invasive anterior surgical approach. J Bone Joint Surg Am. 2003. 85-A Suppl 4:39-48. [Medline]. Ybinger T, Kumpan W. Enhanced acetabular component positioning through computer-assisted navigation. Int Orthop. 2007 Aug. 31 Suppl 1:S35-8. [Medline]. [Full Text]. Michel MC, Witschger P. MicroHip: a minimally invasive procedure for total hip replacement surgery using a modified Smith-Peterson approach. Ortop Traumatol Rehabil. 2007 Jan-Feb. 9(1):46-51. [Medline]. GIBSON A. Posterior exposure of the hip joint. J Bone Joint Surg Br. 1950 May. 32-B(2):183-6. [Medline]. Weeden SH, Paprosky WG, Bowling JW. The early dislocation rate in primary total hip arthroplasty following the posterior approach with posterior soft-tissue repair. J Arthroplasty. 2003 Sep. 18 (6):709-13. [Medline]. Pagnano MW, Trousdale RT, Meneghini RM, Hanssen AD. Patients preferred a mini-posterior THA to a contralateral two-incision THA. Clin Orthop Relat Res. 2006 Dec. 453:156-9. [Medline]. Chow J, Penenberg B, Murphy S. Modified micro-superior percutaneously-assisted total hip: early experiences & case reports. Curr Rev Musculoskelet Med. 2011 Sep. 4 (3):146-50. [Medline]. Woo RY, Morrey BF. Dislocations after total hip arthroplasty. J Bone Joint Surg Am. 1982 Dec. 64(9):1295-306. [Medline]. Minimally invasive total hip arthroplasty: two-incision approach. Photograph of right hip in supine position showing outlines of anterior superior iliac spine and greater trochanter. Dotted line marks anterior incision. Minimally invasive total hip arthroplasty: direct anterior approach. Insertion of acetabular component after acetabular component reaming in supine position. Minimally invasive total hip arthroplasty: direct anterior approach. Circumferential view of acetabular component is shown with visual confirmation of orientation. Insertion guides and radiographs also may be used to assess positioning. Minimally invasive total hip arthroplasty: direct anterior approach. View of proximal femur and right hip in supine position, showing lesser trochanter femoral neck resection marked with pen. Minimally invasive total hip arthroplasty: direct anterior approach. Photograph of right anterior thigh after draping on fracture table. Note metal spar with square holes; this device attaches to fracture table and allows elevation of femur during femoral preparation. Minimally invasive total hip arthroplasty: direct anterior approach. Left femoral head is dislocated anteriorly before osteotomy of femoral neck. Minimally invasive total hip arthroplasty: direct anterior approach. Proximal femoral exposure and rasp is introduced into femoral canal facilitated by fracture table via metal spar elevating femur anteriorly. Minimally invasive total hip arthroplasty: two-incision approach. Surgeon can guide femoral broaches through small posterior incision while palpating through anterior incision. Minimally invasive total hip arthroplasty: two-incision approach. After wound closure, length of anterior incision is approximately 7.5 cm (3 in.). Minimally invasive total hip arthroplasty: direct superior approach. Gluteus maximus fascia is incised sharply to expose gluteus maximus muscle. Minimally invasive total hip arthroplasty: direct superior approach. Gluteus maximus muscle fibers are divided longitudinally, and deep gluteus maximus fascia is divided to expose pericapsular fat; prirformis tendon is detached close to its insertion. Minimally invasive total hip arthroplasty: direct superior approach. Capsule is incised in inferior aspect of wound; capsulotomy is extended posterior and superior to superior acetabulum. Minimally invasive total hip arthroplasty: direct superior approach. Hip is dislocated, femoral neck osteotomized, and femoral head removed. Minimally invasive total hip arthroplasty: direct superior approach. Sharp curved Hohmann retractor is placed over anterior acetabular rim; second bent 90-degree Hohman at inferior margin; 90-degree handheld retractor in superior aspect of wound; and 90-degree sharp Hohmann deep to superior capsule. Optional retractor may be placed on posterior aspect of acetabulum. Minimally invasive total hip arthroplasty: direct superior approach. Acetabular labrum is excised; acetabulum is reamed. Retractor is placed in inferior aspect of wound to retract quadratus femoris away from proximal femur. Disclosure: Serve(d) as a director, officer, partner, employee, advisor, consultant or trustee for: Stanford University<br/>Received research grant from: OREF; OTCF; Stryker; Zimmer-Biomet; Roam Robotics<br/>Have a 5% or greater equity interest in: Arthrology Designs (DBA: PlantarTech), Arthrology Consulting, Ankaa Safe Assets<br/>Received income in an amount equal to or greater than $250 from: Stryker; Exactech; Ethicon<br/>Patents: Dynamic Tension Plantar Fasciitis Splint; Cool Cut Cast Saw, Modular Total Knee, Augmented Reality Arthroplasty; Surgical Instrument Visualization System for: Honoraria: WebMD.